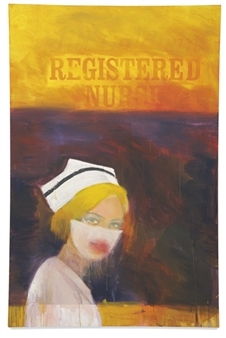 Registered Nurse, by Richard Prince. 2002. In their book, From Silence to Voice, Bernice Buresh and Suzanne Gordon discuss the silence of the nursing profession in the media. Chapter after chapter, they expose how reluctant we are to share with the public the details of our job, how we hide behind the stereotypes and discriminations of our profession, and, most importantly, what we lose because of this silence. I’ve picked it up again, after my first read years ago. It’s funny, to see the notes I scribbled in the margins then. Lots of ?!?!? and WHY DO WE DO THIS?! It’s not so funny, seven years later, to realize how much remains unchanged. Over the weekend, on a bus ride back from a quick DC trip to see my sister, I read the chapter entitled, “Presenting Yourself As A Nurse.” I remember reading this so long ago, thinking their recommendation to introduce myself as “Nurse Anderson,” while expecting other providers to address me as such, seemed kind of dated. Do I want to be called Nurse Anderson by interns who are now, a growing handful of years younger than me? Kind of feels like being called “ma’am” by a stranger in the grocery store. But they make a good point: the discrepancy between doctor’s and nurses title usage – doctor’s always introduce themselves as such, while nurses are often the mysteriously untitled profession – solidifies physician-identity in the mind of the patient and, ultimately, the public. Sure, when chatting at the nurses station, first-name basis between providers is fine, but in introductions to patients or family, first-name-only-nurses surrender their professional identity. I floated to endoscopy yesterday. Assigned to man the recovery room with two other nurses, I pondered this identity challenge, and decided to conduct some experiments. As sleepy patients wheeled in from their various procedures, I’d give them a little shake, and with Buresh and Gordon in my brain, I’d say, “Hello! I’m Amanda, I’m a nurse,” to their crusty-eyed, confused gaze. Just coming out of twilight anesthesia, many marveled at the simplicity of my greeting, and its ability to provide them with much needed context. Not one of them asked me where they were, or who I was, and honestly, it felt good to title myself openly. I used my new, identity-charged greeting all shift – when I called the pharmacy for medications, I said, “Hi! I’m Amanda, I’m a nurse calling from endoscopy.” When I phoned the operator to connect me to another unit, “Hi! I’m Amanda, I’m a nurse,” came easily, and I was shocked at how clearly it was received, and how many clarifications it saved me. While I fluidly added my title to my introductions, making them direct and clear, I was amazed at how muddled and ambiguous my co-nurse’s greetings sounded in contrast. Smiling down at her sleepy patients, she said, time and time again: “Hello! I’ll be taking care of you.” Huh? Where am I? Who are you? Were the most common responses. I’ll admit, I’ve said this phrase countless times. But hearing it in the shadow of Buresh & Gordon’s recommendations, made me wonder why we nurses think it’s acceptable – are we ashamed to call ourselves “nurse,” or do we just not recognize how important our title is? In an era where nurses no longer have a recognizable image, where we all work in different capacities and at different levels, and where our education and practice is frequently called into question, it is becoming clearer and clearer how closely-linked the act of verbal title distinction is to our professional success. By neglecting to state who we are – the nurse – we give up control of our identity, our rights to our work, our voice as a profession; our silent namelessness allows us to become whatever stereotype is the most convenient, or the most useful. My titling experiment cemented itself into forever-practice around three pm, when I prepared to call report on a patient who was returning to her bed on the floor. I asked the patient if she knew her nurse’s name, to speed up the phoning process. She told me it was Samantha, who I requested when I phoned the unit. “Oh, Samantha is the nurse’s aide, I’m Jane. I’m the nurse.” Damn. All that work, all that time, all that expertise, all that knowledge, and the patient still has no clue who we are. A simple switch of the tongue might be a start to something big, nurses. While I may not introduce myself as Nurse Anderson just yet, I’ll definitely be seasoning my communications with my title from here on out. This is very true. You are never *just* the nurse.